Kumquats, a citrus fruit from the orange family, are a winter produce available from January to March or April. These little oval-like gems may not be available for too long, but when they are in season, their bright, sweet-tart citrus flavor is stunning, irresistible, and addictive. When you are lucky enough to find these tiny fruits, you will want to enjoy them to the fullest, so choosing the right recipe is important. Always choose bright, plump kumquats. They will not have much of an aroma, but their peels should look shiny and taut. Store kumquats at room temperature. Make sure to stock up on them since you will probably find that kumquats tend to disappear in the blink of an eye. This is one type of citrus fruit you not peel. Kumquats are great just as they are, skin and all. The peel is actually a bit sweeter than the pulp, so eating them whole gives them a balanced flavor. Keep a bowl on the counter for an easy, vitamin C-packed snack. You can spit out the seeds if you want, but they are edible too. 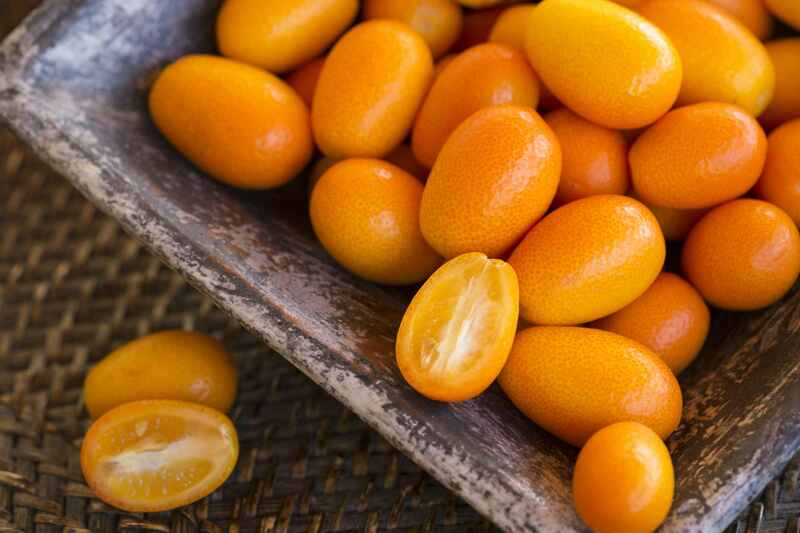 Look for organically grown kumquats, and make sure to rinse them clean and pat them dry no matter which type you buy. The sour tang of kumquats works great with many of the greens available in winter, especially endive and spinach. Halve, chop, or thinly slice the kumquats before adding them to the salad. One green salad to try is an endive kumquat salad, made simply with fresh herbs, lemon juice, and a neutral oil. Kumquats—halved or chopped—add a tangy sweetness to a fruit salad. They are extra delicious with kiwis (also a winter fruit)​ but consider simply combining them with other sliced citrus fruits to achieve a delicious and colorful effect. A bit of mint also adds a brightness and freshness to the dish. Preserving kumquats allows you to literally capture the fruit's sweet-tart flavor and seal it in a jar to use any time you like. Combined with a bit of diluted honey and some sugar, the result is luscious and delicious. This preserve is not too much trouble to make, either. Serve the preserves spooned on ice cream, plain yogurt, or even a dish of ricotta cheese. This preserve and its syrup can also make a fantastic glaze for pork or ham. A kumquat-orange marmalade is perfect for spreading on toast for a delightful start to the morning. Kumquats and orange are finely chopped in a food processor, combined with sugar, and boiled until thick. This fresh jam will last up to two months in the refrigerator or six months in the freezer. Flavored vodkas are easy to come by in several fruit varieties, but finding one that is made with kumquats can be challenging. Luckily, making your own kumquat vodka couldn't be easier—it simply requires soaking some kumquats in vodka for a day or three. The result is bright, fresh, citrusy, and boozy, of course. Drink it neat, iced, shaken into a martini, or mixed into a fruity cocktail. The liquor-soaked kumquats are the perfect cocktail garnish. Prefer gin? Use it instead of vodka. Incorporating kumquats into a cake is a wonderful way to enjoy this special fruit. You can cut it up and use it as a topping or pureed and incorporated into the batter. Kumquats bring an unexpected but welcome touch to an otherwise simple cake. Puree kumquats and add it to a batter tinged with ginger and studded with crushed almonds. This combination makes for a refreshing bundt cake. The sweet citrus taste of the fruit adds a nice hint of tartness, complemented by a glaze made of sugar, butter, and lemon juice.